The story of the Pittsburgh Penguins of the ten-year period from 2009 to 2018 reads like a classic Greek tragedy, filled with gut-wrenching plot twists and turns. After rising from the ashes of the early 2000s on the wings of young stars Sidney Crosby and Evgeni Malkin to capture the 2009 Stanley Cup, the Penguins were hailed as hockey’s newest superpower. However, plagued by a career-threatening concussion to Crosby and a series of ghastly playoff exits, the would-be dynasty hit the skids. Dismayed over the downward spiral, ownership cleaned house and turned to long-time Carolina general manager Jim Rutherford in an effort to restore the club’s sagging fortunes. With coach Mike Sullivan now at the helm and scorer Phil Kessel on the roster, the Pens put together a stunning resurgence, capturing back-to-back Cups in 2016 and 2017. 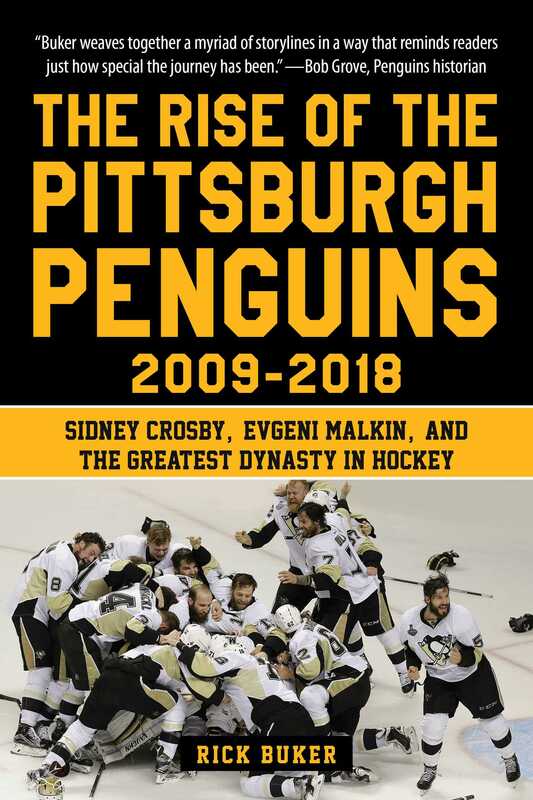 In The Rise of the Pittsburgh Penguins 2009-2018, Rick Buker details how the Penguins have become the strongest hockey dynasty of the 21st century to date. This book ties that 10-year span together in an easy-to-read format, including an appendix at the back with season by season stats. The perfect gift for any fan of Pittsburgh hockey! Rick Buker is an avid hockey fan and freelance writer who writes for popular website penguinpoop.com. He is the author of Total Penguins: The Definitive Encyclopedia of the Pittsburgh Penguins and 100 Things Penguins Fans Should Know & Do Before They Die. Buker resides in Pittsburgh, Pennsylvania.